It has been three months since my last post. It doesn't feel like that long though... My mind is rewinding the past couple months to see if I can come up with any excuse for my leave. No, I can't find any thing except that I've been just lazy. 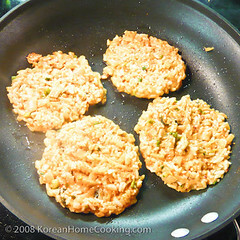 I come back with a kimchi-cheese rice patty recipe. 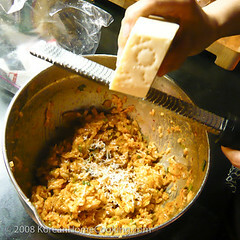 Kimchi and cheese may sound like the least sought-after combination of food ingredients. 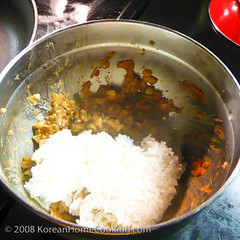 When these two ingredients meet together, however, with some help of a middle man which is played by rice in this case, a real Korean-western fusion recipe is born. 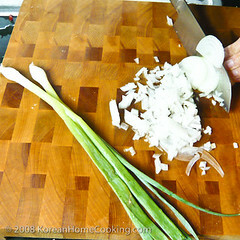 Cheese and rice help the ingredients stick together while softening the tangy flavor of kimchi. Agreed there is always some risk involved when making a fusion dish, but don't be afraid to put on your experimentalist' apron when you are cooking. The finished product comes almost always with a delight surprise on your palate like this one. 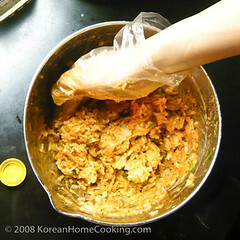 Chop kimchi and drain excess water by squeezing it tight. 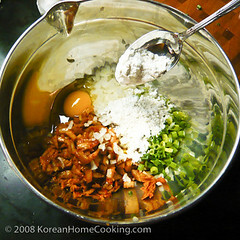 Add kimchi, onion, green onion, an egg, and flour. Add rice to the mix. Make rice patty and fry over medium heat. It's nice that you are back! 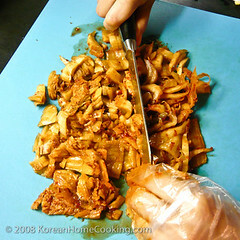 I love Korean food so I am always happy to find more Korean recipes. 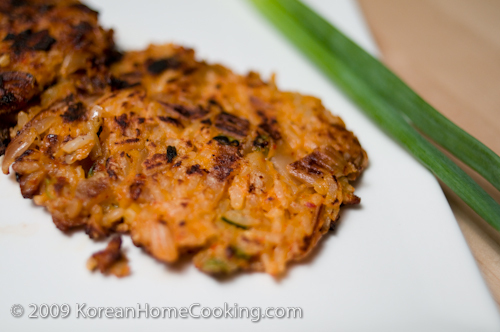 These kimchi patties look fantastic. I will try these today since I have some leftover kimchi. Thanks for posting this! Mmmm, this looks so good and easy too. I'll make this for my kids at lunch. Thanks, and I'm happy you're back! I've always loved kimchi and cheese flavor combination. My "theory" is that both of them are fermented food so they go together quite well, if you ask me. :) I like my kimchi fried rice topped with either mozzarella(or gruyere if you want to be fancy) or cheddar, but parmesan sounds interesting, too. Thanks for the great recipe. I bet this would be great as a burger:) I shall try!